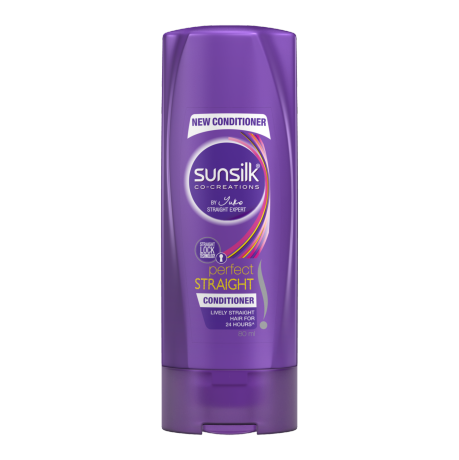 • Sunsilk Perfect Straight Conditioner, when used along with Sunsilk Perfect Straight Shampoo, ensures hair retains its natural straightness through the day*! • Its straight lock and revolutionary conditioner technology helps maintain straightness and prevents frizz, making your hair a breeze to manage. 1. Use after you shampoo, on wet rinsed hair. 2. Apply a coin sized amount of conditioner. Apply evenly over the hair, especially on the tips. Leave the conditioner in for a minute. 3. Rinse with water till conditioner washes away. Best results when used with Sunsilk Perfect Straight shampoo. Water, Cetearyl alcohol, Dimethicone and amodimethiconeand PEG-7 propylheptylether and cetrimonium chloride.Perfume, Stearamidopropyldimethylamine, Mineral oil, Hydrolyzed silk extract, Sodium chloride, disodium EDTA, Lactic acid, Methylchloroisothiazolinone and Methylisothiazolinone.